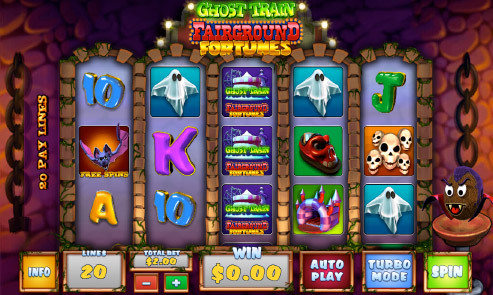 Fly Casino now has Ghost Train Fairground Fortunes. This new 5 reel, 20-line video slot at Fly Casino arrives just in time to make your October 2017 spooky and fun. Coconut Scatter (with added random wins): get 2, 3, 4 or 5 of these anywhere on the reels 2, 5, 20 or 100 times your total wager. Special Feature! Located on the lower right side of the game is a cartoon coconut dressed up like a little monster. This cute guy can randomly turn into a baseball player (funny) and throw a baseball at the reels turning symbols into scatters. Ghost Train feature –Landing Ghost Train symbol on reels 2, 3, 4, triggers a cash train whereby you take a ride collecting cash bonuses whenever it stops. When you reach the end of the cash ride, you’ll be offered a pair of tickets – 1 is a game over, the other a ride again which gives another trip along the track. These continue until you land a game over ticket. If you trigger the round with 2 standard symbols plus 1 gold ghost train symbol, you’ll get at least 3 rides along the track. Free Spins feature + 30 more lines! – Land the free spins symbols on reels 1, 3 and 5 and you’ll be awarded 10 free spins. BUT, these free spins are played with 50 paylines! This can be re-triggered UNLIMITED times! 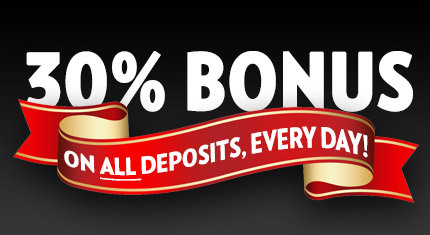 It’s Back…30% Bonus Every Deposit, Every Day! Back by popular demand of our members, Fly Casino offers you to jump into the fall season with unlimited bonuses October 1-15, 2017. That’s right, in addition to the promotions below, you are invited to claim a 30% bonus up to $/€300.00 on every deposit of $/€50 or more. 150% Bonus up to 150.00! On Sunday from 00:00GMT until 23:59 GMT, all members will receive a 150% bonus up to 150.00 on your deposits of $/£/€50 or more.